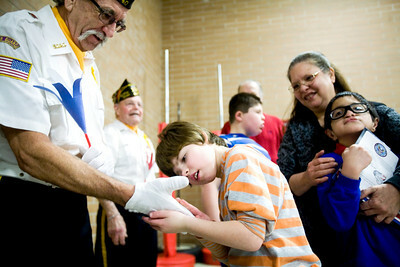 Jenny Kane - jkane@shawmedia.com Wed. Feb. 22, 2012, Alexis Gaylord, (center) who is visually impaired, feels the glove of Vietnam veteran Mark Freund, of Union, while Peggy Wold holds Ricky Trinidad during the Special Education District of McHenry County's Take a Veteran to School Day at the SEDOM Education Center in Woodstock. The veterans took questions from students and passed out candy and flyers. 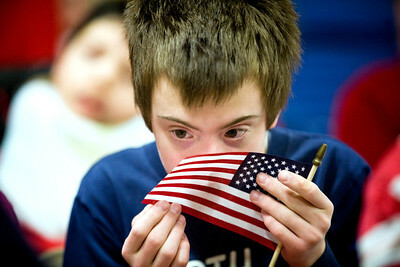 Jenny Kane - jkane@shawmedia.com Wed. Feb. 22, 2012, Leo Anderson feels the American flag an assembly held at the Special Education District of McHenry County Education Center in Woodstock. The assembly had local veterans meet the students and answer questions about their service. Jenny Kane - jkane@shawmedia.com Wed. Feb. 22, 2012, Coast Guard veteran Jason Paddock, of McHenry, sits down and talks with Francis Weir after an assembly at the Special Education District of McHenry County Education Center in Woodstock for Take a Veteran to School Day. 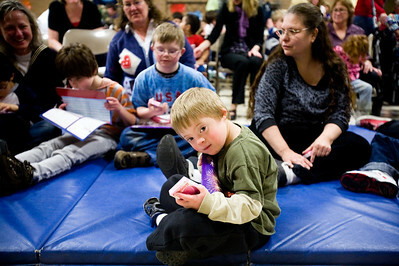 Jenny Kane - jkane@shawmedia.com Wed. Feb. 22, 2012, Nicholas Boguchi waits for an assembly at the Special Education District of McHenry County Education Center in Woodstock to begin. The assembly was for Take a Veteran to School Day. Jenny Kane - jkane@shawmedia.com Wed. Feb. 22, 2012, Coast Guard veteran Jason Paddock, of McHenry, walks with Francis Weir after an assembly at the Special Education District of McHenry County Education Center in Woodstock for Take a Veteran to School Day. Jenny Kane - jkane@shawmedia.com Wed. Feb. 22, 2012, Coast Guard veteran Jason Paddock, of McHenry, talks with Francis Weir after an assembly at the Special Education District of McHenry County Education Center in Woodstock for Take a Veteran to School Day. 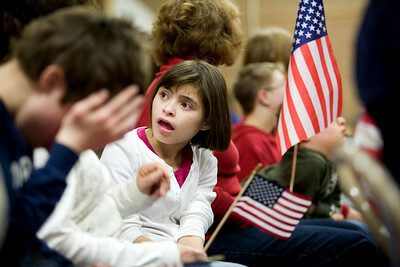 Jenny Kane - jkane@shawmedia.com Wed. Feb. 22, 2012, Veteran Scott Tanneberger talks with Scott Maier, of Crystal Lake, during an assembly at the Special Education District of McHenry County Education Center in Woodstock for Take a Veteran to School Day. Jenny Kane - jkane@shawmedia.com Wed. Feb. 22, 2012, United States Army veteran James King talks with Scott Maier, of Crystal Lake, during an assembly at the Special Education District of McHenry County Education Center in Woodstock for Take a Veteran to School Day. 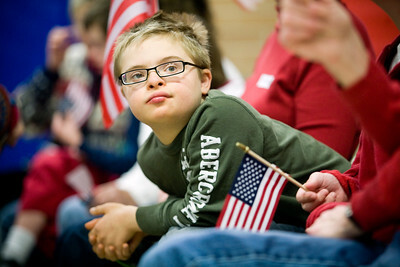 Jenny Kane - jkane@shawmedia.com Wed. Feb. 22, 2012, Daniel Young, (center) sits during an assembly at the Special Education District of McHenry County Education Center in Woodstock for Take a Veteran to School Day. Jenny Kane - jkane@shawmedia.com Wed. Feb. 22, 2012, Ashley Hannon waits for an assembly at the Special Education District of McHenry County Education Center in Woodstock to begin. The assembly was for Take a Veteran to School Day. 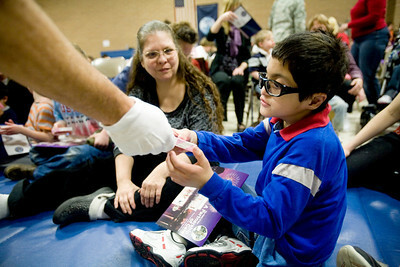 Jenny Kane - jkane@shawmedia.com Wed. Feb. 22, 2012, Peggy Wold watches as Ricky Trinidad receives a box of candy from a veteran during an assembly at the Special Education District of McHenry County Education Center in Woodstock for Take a Veteran to School Day. 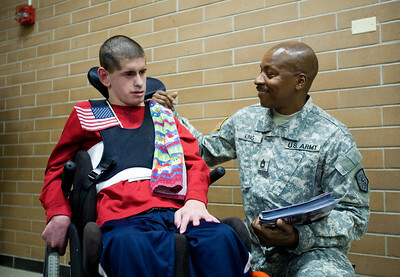 Wed. Feb. 22, 2012, Veteran Scott Tanneberger talks with Scott Maier, of Crystal Lake, during an assembly at the Special Education District of McHenry County Education Center in Woodstock for Take a Veteran to School Day.